1979-12-27. Good. Ships with Tracking Number! INTERNATIONAL WORLDWIDE Shipping available. May not contain Access Codes or Supplements. May be ex-library. Shipping & Handling by region. Buy with confidence, excellent customer service! London: Newnes, 1960. 248pp. Blue boards. Gilt lettering. Touch of foxing and staining to endpapers and edges but generally very clean. Book firm and unmarked. Maps endpapers. D/W clipped. Light scuffing to edges of wrapper. In the Lone Pine series.. 1st Edition. Hard Cover. Very Good/Very Good. 12mo. London: Newnes, 1960 Fine in a near-Fine unclipped d/w, just a few tiny grazes/rubs, a lovely copy. 1st Edition. Hard Cover. Fine/VG+/Fine. London: London : Newnes 1960. Very Good in Very Good+ dust jacket. 1960. First Edition; First Printing. Hardcover. Hbk in d/w, Vg/vg+ .1st edition; nice copy in attractive dustwrapper; hint of foxing to blocked page foredges; ; Lone Pine; 8vo 8" - 9" tall; Reduced . London: Collins, 1972 1st thus 1972, one tiny bump, otherwise a near-Fine copy, SIGNED by the AUTHOR on the half-title. Signed by Author. 1st Thus. Hard Cover. VG+/Fine/Issued Without Dustwrapper. Published by George Newnes Ltd., Tower House, 8-11 Southampton Street, Strand London First Edition 1960. 1960., 1960. First edition hard back binding in publisher's original navy cloth covers, gilt lettering to the spine and the upper panel, end paper maps. 8vo 7½'' x 5¼'' 248 pp. Fine condition book in Very Good condition price clipped panoramic dust wrapper with only very minor surface rubs to spine tip and corners, spine colours not faded. Dust wrapper without any tears or chips and supplied in archive acetate film protection, this is not adhered to the book or to the dust wrapper and can easily be removed should you so wish. Member of the P.B.F.A. England: Newnes, 1960. Book. Very Good. Hardcover. First Edition. 12mo - over 6¾" - 7¾" tall. Jacket is not price clipped. Wear to corners, small edge tear (1cm) to front panel. Very nice copy of this 1st edition..
London: Newnes, 1960 near-Fine in a near-Fine price-clipped d/w, jminor rubs and a mild vertical graze on spine, a nice copy. 1st Edition. Hard Cover. VG+/Fine/VG+. 0 First Edition/First Printing Published by George Newnes, London 1960. No marks or inscriptions. Bright cloth covers. Dustjacket not price clipped. Good condition with general wear and creasing to edges. London: Armada, 1980. 159pp. Clean copy. No inscriptions. Includes supply & fitting of new correctly sized protective lyfjacket.. First Thus. Paperback. Very Good. Newnes, 1960. Hardcover. Good/Acceptable. 1960. First Edition. 247 pages. Pictorial dust jacket. Binding is firm with light tanning throughout and mild foxing to page edges and endpapers. Previous owner's name to endpaper and paste down. Boards have mild shelf wear with light rubbing and corner bumping. Some light marking. Boards are a little limp and book has a slight forward lean. Jacket has light edge wear with minor tears and chipping. Mild rubbing and marking. Jacket has been price clipped. London: Armada, 1980. 159pp. Minor external wear. Internally VG. No inscriptions. Includes supply & fitting of new correctly sized protective lyfjacket. Typical browning apparent to edges.. First Thus. Paperback. Good +. George Newnes Ltd., 1960. Hardcover. Acceptable/Acceptable. 1960. First Edition. 247 pages. Pictorial dust jacket. Binding is firm. Missing endpapers with pieces still remaining. Light tanning, staining and thumb marking throughout. Boards have mild shelf wear with light rubbing and corner bumping. Some light marking. Jacket has light edge wear with minor tears and chipping. Mild rubbing, scuffing and marking. Some heavy tanning and foxing to inside of jacket. Girls Gone By. New. 2012. Unabridged. Softcover. 1847451349 . 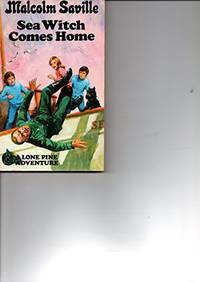 New book; complete and unabridged; Lone Pine; Vol. 13; 8vo 8" - 9" tall . London: George Newnes Ltd, 1960. Hardcover in good condition. First edition. A Lone Pine Thriller. The price clipped jacket is scored and worn, with a few slight nicks to the edges. Minor wear and one or two bumps to the hardcover edges. Foxing on the page block, slightly affecting some page edges. Spine is slightly cocked but binding remains sound. All text is clear. CM. 1st Edition. Hardcover. Good. Used. Newnes, 1960. Hardcover. Good. 1960. 247 pages. No dust jacket. Blue boards. Binding is firm. Light tanning and thumb marking throughout. Mild foxing, mainly affecting the endpapers and page edges. Mild page scuffing with some dog-eared corners. Boards have mild shelf wear with light rubbing and corner bumping. Some light marking. Sticker to front board. England: Collins, 1972. Book. Very Good. Illustrated Boards. 8vo - over 7¾" - 9¾" tall. Lovely copy only very slight toning of pages that is common in these editions..
Merlin M27 [M27] 1968, 1st thus. (Mass market paperback) Very good. ... Previous owner's name. ... Series: Lone Pine. ... (Mystery). GB: Paul Hamlyn, 1968. Merlin M27. Book is in very good plus condition with very minor signs of wear and/or age. Spine a bit creased.. 1st Edition. Paperback. VG+. HarperCollins Distribution Services, 1979. Book. Good. Soft cover. Not an ex-library edition. Text body is clean, and free from previous owner annotation, underlining and highlighting. Binding is tight, covers and spine fully intact. Cover shows some surface and edge wear. Some yellowing to page edges..
London: Paul Hamlyn, 1968. VG, Edgewear, creases, indentations, light browning. Children's adventure. Merlin Books M27. Expanded condition report/digital photo on request.. First Hamlyn Edition. Mass Market Paperback. UK: The Children's Book Club, 1960. Blue bds with black titles to spine. bump to spine ends and corners. spine sunning. owners name to bottom outer edge of text block. Owners sticker to half title. bindngs tight. Interior very good and clean. . Hard Cover. Very Good -. 12mo - over 6¾" - 7¾" tall. New South Wales Aboriginal Place Names and Euphonious Words, with their Meanings. Sydney, Australian Museum, 1971. 8vo. or.wrap. Fifth revised edition. Very good copy. #AAA1. New South Wales Aboriginal Place Names and Euphonious Words, with their Meanings. Buy with confidence from one of Australia's oldest bookshops established in 1975. London: Paul Hamlyn, 1968. VG, Edgewear, creases, spine lean, ink name, light browning. Children's adventure. Merlin Books M8. Expanded condition report/digital photo on request.. First Hamlyn Edition. Mass Market Paperback. London: Armada, 1980. VG, Edgewear, creases, soiling to rear cover, browning. Children's adventure. Photo on request.. First Armada Edition. Mass Market Paperback. UK: The Hamlyn Publishing Group Ltd, 1968. 3 corners creased. spine ends slightly rubbed.. First Thus. Mass Market Paperback. Very Good. 12mo - over 6¾" - 7¾" tall. Armada, 1980. Paperback. Good. 1980. 160 pages. Pictorial paper cover. Book is in better condition than most examples of this age. Neat, clean, well bound pages with light foxing, tanning and thumbing. Small inscriptions and neat labels may be present. Paper cover has mild edge wear with light rubbing and creasing. Some light marking and sunning. England: Hamlyn, 1968. Book. Good. Mass Market Paperback. Creased spine. Tape marks to first & last pages & inside of covers. Where possible small books will have postage reduced. Flowers for Algernon. SF Masterworks.